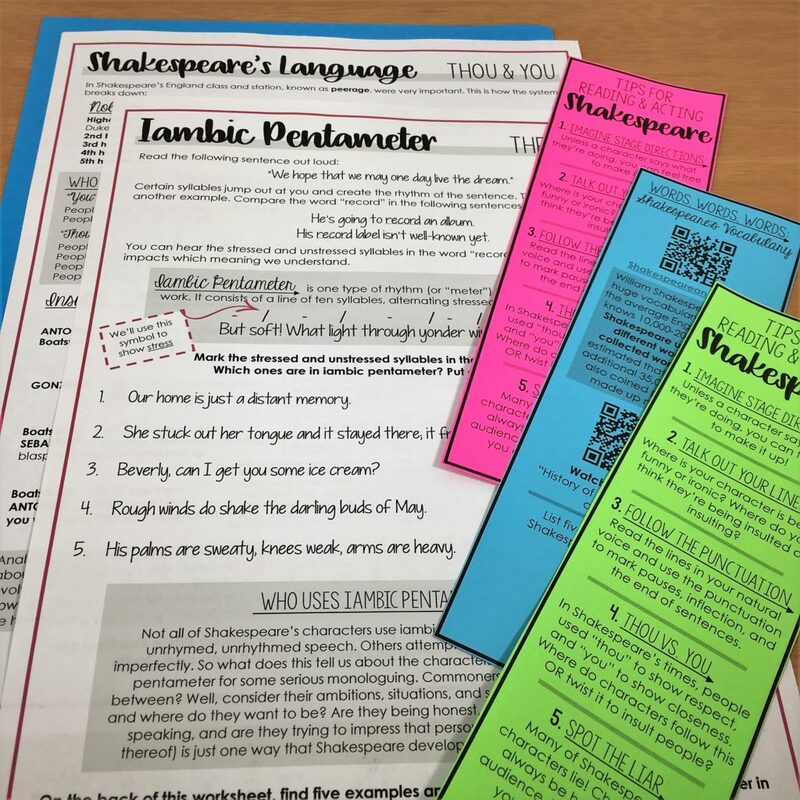 Teaching Shakespeare can be a tricky prospect, but here are some tips to help you and your students get the most out of your unit. Students have very different reactions to Shakespeare based on their experiences and expectations. I want to advocate for teaching Shakespeare through performance, and I’ll be talking more about that in the next few weeks. Today, I want to talk about how to approach an unmarked script. If you give students any script outside of their literature anthology (like a play from my Shakespeare in 30 collection, for example), it’s likely going to be unmarked. This means that there likely won’t be any direction for staging or voice. This is one of the joys and challenges of teaching Shakespeare: it’s so versatile! Here are concrete tips you can give students. 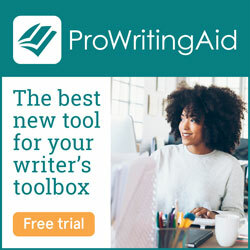 You can use these for Reader’s Theatre, a Staged Reading, or a Full Production. Shakespeare included few stage directions. Editors, including us, have added some for clarity. Students can imagine their own blocking for the scripts. This is one aspect that makes Shakespeare’s work so adaptable: we can imagine the scenes set in any time period, with any characters. Students should work through their lines to figure out their meaning. Shakespeare often uses puns or word play to give scenes layers of meaning. This is part of the beauty of the work, and students will give a better performance if they’ve decided or discovered what a line means. You can have them start by reading through the lines out loud (even before they understand them) to see what kind of meaning they can uncover. Students can often sense whether their character is angry, joyous, or flirting before they ever understand the vocabulary. Young actors tend to read Shakespeare’s scripts with the sing-songy voice they associate with poetry. Whereas some of Shakespeare is poetry, students should read the lines in their natural voices and use the punctuation to mark pauses, inflection, and the end of sentences. That being said, editors have adapted punctuation, and students can also adapt this as they feel more comfortable. Part of teaching Shakespeare is teaching students how to transform the work for their own. In Shakespeare’s time, people used the pronouns “thou” and “you” based on rank and intimacy and followed strict rules. In Shakespeare’s plays, we notice that characters employ these pronouns to show respect. They can also use pronouns to insult another character, however. This usage can tell the audience a lot about the relationships unfolding on stage. You can grab a worksheet for helping students understand “Thou” and “You” at my TeachersPayTeachers store. William Shakespeare had an enormous vocabulary. Whereas the average English speaker knows 10,000-20,000 words, Shakespeare used 31,534 different words in his collected works. It’s also estimated that he knew an additional 35,000 words. He also coined phrases and made up new words. Students simply need to embrace this fact—most people must use a dictionary to understand every word in a scene! As they discover their lines’ meaning, students will see that many of Shakespeare’s characters lie. They lie to themselves and each other, at different times for different purposes. Characters will always be honest with the audience in asides, however, so students can use these moments to discover their characters’ true motivations. Students should ask themselves about their characters’ motivations in each scene to help them determine the meaning of the lines and the movement of the action. That’s all for today. If you want some scripts to work on with your students, try our Shakespeare in 30 collection. These are all 30-minute versions of your favorite plays, created and performed with students, grade 7-12. 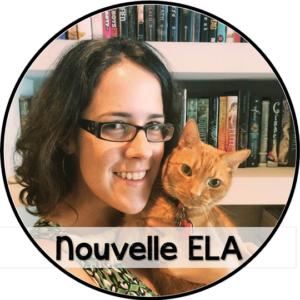 If you have any questions, let me know in comments or reach out on social media @nouvelle_ela.